Two goals in the final minutes and Vignareal won the entire post against a strong Atalanta at the end of a match fought openly by both teams. The first of the spring season thus rewards the highest conviction of the locals in seeking success. Yet the girls of Mr. Cambiaghi have not at all disfigured, indeed. Faced with a good level of training, technical, capable of quick reboot ball on the ground, they played at the same time the first half, held up the opponents in the recovery and resisted until they could in the final rush. Unfortunately, the Beginners have not been able to "sting" forward, so that the network opportunities created were very few, but they played a good defensive game with the rear almost never in trouble, helped in this by the protection of the median. First minutes of study then the rhythm rises and the match becomes fun, with continuous reversals in front, even if rather stingy with emotions. Youth Sector: The "Young Footballers" training of Agsm Verona in the "Temple of the Blue National" for the "7 ° Grassroots Festival" conceived by UEFA. The Gialloblù also ended unbeaten in Coverciano an extraordinary season. 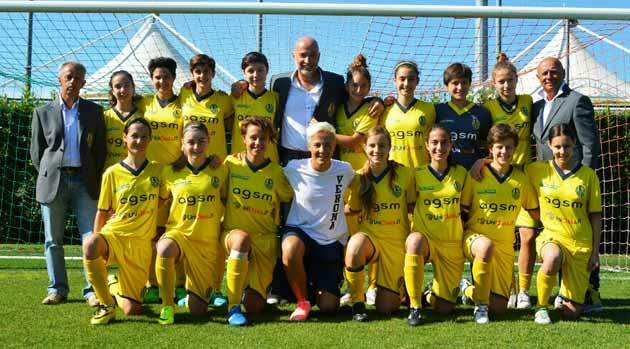 Thanks to the regional title achieved by winning both the autumn and the spring phase of the "Giovani Calciatrici" championship, the Gialloblù children of Agsm Verona have won their participation in the "7 ° Grassroots Festival". 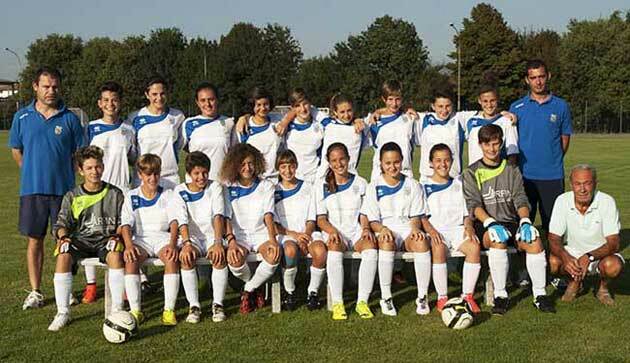 The event, conceived by UEFA for the development of youth football, for men and women, is organized by the Italian Football Federation on Saturday 20 and Sunday 21 on June at the Federal Technical Center of Coverciano, the home of the Italian team. The scaligers this Saturday represented the Veneto at the parade of all the delegations present. Celebrating the Grassroots festival is always a great emotion that involves not only the young athletes, but also technicians and parents. 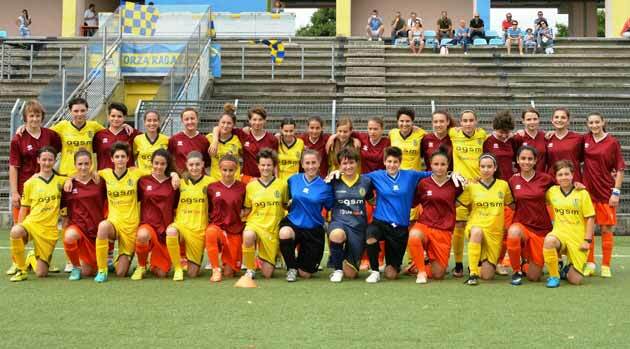 END 2 TO 2 THE LUXURY FRIENDLY AMONG THE BABY GIALLOBLOS OF THE AGSM VERONA AND THE VENETA REPRESENTATIVE UNDER 15. 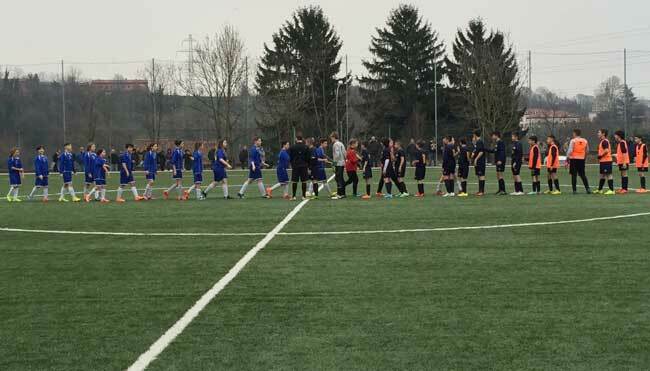 This Sunday, 14 June, in a friendly match on the synthesis of via Sogare, the Youth Team of Agsm Verona (regional category champions) and the Veneto Representative under 15 of the FIGC took part in a friendly match. The match, balanced and exciting until the last minute, was used to prepare the Representative at the Tournament of Regions organized by the FIGC and reserved for regional representatives under 15, and at the same time to keep the baby yellow-blue trained in view of the national event that will see busy next weekend representing the Veneto at the Federal Technical Center of Coverciano. 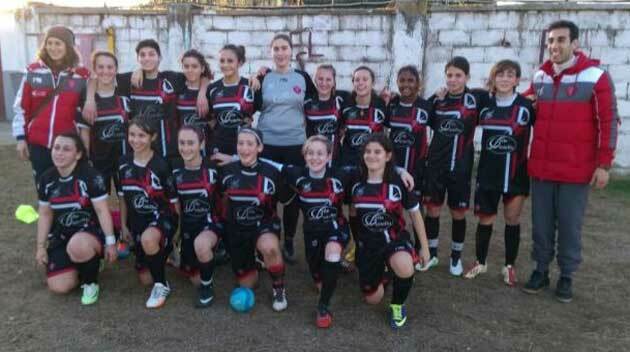 In the first of the three times played, the two Gialloblù summoned by the Regional representative, Veronica Pasini and Angelica Soffia, took to the field with the Scaliger team, while in the remaining two times they wore the Veneto shirt. The biancorossa society will take part in the "very young" tournament organized by Graphistudio Pordenone. Last weekend in May and the very young (1999-2000-2001-2002) of Grifo Perugia leave for the Friulian city where they will participate in the first edition of the San Quirino Trophy organized by the local team of Graphistudio. Six participating companies will be divided into two groups. Group A will consist of the local team, ACF Tradate and AS Crusaders Parma, group B from Grifo Perugia, Fiamma Monza and ASD Real Aglianese. The large group of Perugia will leave Saturday morning for Pordenone to play the first race at 18,00 and the second at 20,00. The first two of each group will face each other in the semi-finals crossed at h. 10,00 on Sunday, the third classified instead will compete for the fifth place at 14,00 always on Sunday. The goal of the red and white will be to be together, group and have fun, the result will not affect the playful aspect. Subdued performance, assured loss. Two counter-attack goals - one in the first, the other in the third half - give the victory to the Argentia (scoreless recovery) on the field of the Oratory of Gorgonzola. The Beginners have not been able to develop their game, made of ball possession, phrasing and triangulation. Guilt also, but not only, the irregular background with often unpredictable rebounds of the sphere. 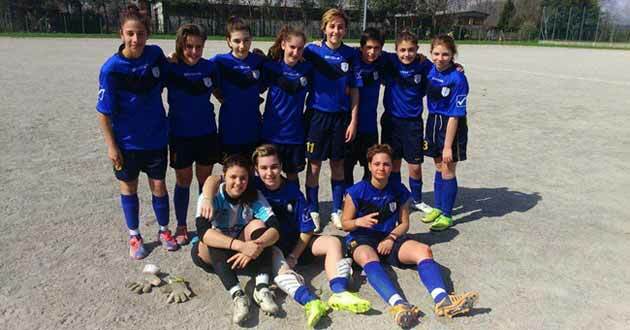 It is also true that the girls of Mr. Cambiaghi have appeared soft, less concentrated and determined than usual. In addition the biancocelesti offensives were regularly slammed in front of the "wall" guest. The team has confirmed to suffer the formations perched, all defense and clearance game. The game was still rather ugly with few opportunities from the network for both teams. 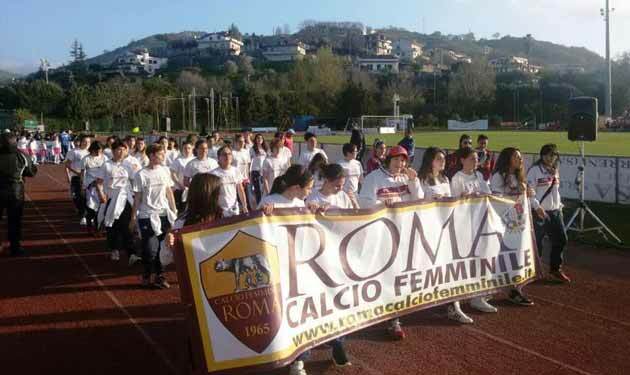 The Agropoli Tournament ended with a real Giallorossi triumph. 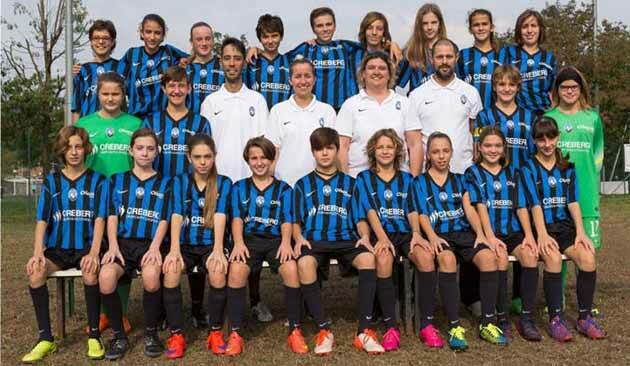 The women's soccer school in Rome has won the Cup both with the team under 14 and under 16. Festive days for girls and the Romanist staff dedicated to sport, but also friendship. Very healthy agonism in the field, but out of the green land old friendships have been strengthened and new ones have been born. The atmosphere was breathtaking and while at the Olympic Stadium in Rome there was a Roma - Napoli that allowed to talk about itself especially for offensive banners, in Agropoli Rome and Naples they took compliments from the media and from all the football lovers because they clung in a healthy twinning based on the joy of both teams to compete only in football. After two consecutive draws in scoreless squares, the Tradate returns to victory with a round 3 at 0 against the Azaleas of Gallarate. Still without five girls due to injury, the Tradate girls took to the field determined to win the final victory with the help of three rookies. The start of the race is quite balanced, the hosts go to the conclusion from the distance with Brugioli E. and Scarpelli that hits the post. After a long series of corners, captain Brugioli took the lead with a subtended conclusion from the center. It is always the captain who takes on the shoulders the weight of the organization of the game and a conclusion from the edge of the area, at the end of the time, the doubling comes. The recovery opens with the Tradate leading to the conclusion, from the edge of the area, Scarpelli and De Carli, but without disturbing the goalkeeper. Draw in comeback for the Debutants in the home match against Bussero. A result result of another great performance and that is close to Mozzanica, more convincing opponents for both the size of the game and the character aspect. It was a fought and enjoyable match between two teams that make the game their trademark. The girls of Mr. Cambiaghi led the dances and became more dangerous. Taken a counterattack goal in the only attack action of the opponents in the first half, they were good in the recovery to stay in the game and, thanks to a third arrembante, have deservedly grabbed the same. The Bussero, found in the lead, could not close the match. Note of merit for the defenses that have minimized the opportunities from opponents net. 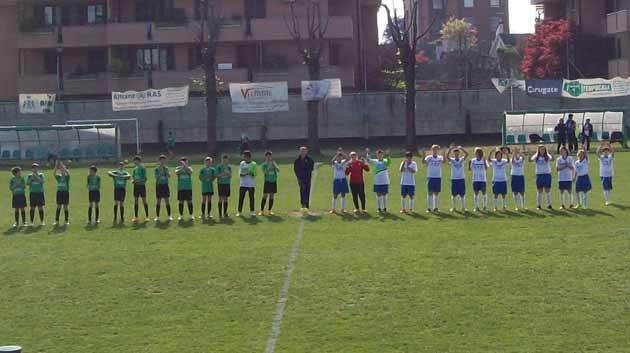 Without captain Brugioli and without five other players, including injuries and disqualification, the girls of Tradate appear in Orio al Serio on the field of the orbica for a difficult game and with the debut of some girls beginners. The landlords start strong but the first conclusion to the network is the Tradate con Boldini. It is always the Orobica who leads the game, the Tradate is not crushed in his own defense and does not run big risks, only at the end of the time the landlords hit the crossbar with beaten Bogni, from an action developed on the right. The first time closes on 0 to 0. In the second half the music does not change, it is always the most active Orobica, the Tradate acts and tries to build some action by goal without too much concern for the defense of the house. Our girls are able to contain well, without too much trouble, the actions of the landlords who seek the conclusion only with shots from a distance. The Orobica makes its four substitutions while the Tradate, not having players on the bench, does not make changes. The game ends with a sweaty and deserved draw of our girls who have been able to face the emergency with courage and determination, the results will arrive in full ranks. Tuesday 17 March night match for the Giovanissime home Mozzanica, recovery valid for the 16th day of the league against the age of 'Inter, a clash of the titans, the top of the standings, in fact the summit is very tangled, stands the Brescia with 51 points chase Mozzanica to 49 but with a match to recover, Real Meda to 46 with 2 recovers and Inter to 45 but with three recoveries. The squad of former Mister Moro, comes with the best defense of the championship, only 5 the goals conceded, while the Mozzanica responds with the best attack of the 123 championship goals, a Champions League final match! Not even the time to feel to hear the first notes that the Bergamo take the lead: crazy horse anghilieri rides the left wing, crossed by the kiss for the riveting Zanetti that inflate the net! 24 absolute record seconds.